While Plymouth made several muscle cars in 1968, the big C-bodied Fury III didn't have a true muscle variation that year. That got me thinking... what if Plymouth had made a Hemi-powered muscle car version of the Fury? And then, what if 40 odd years later somebody decided to build a pro-touring resto-mod version of that car? What would it look like? 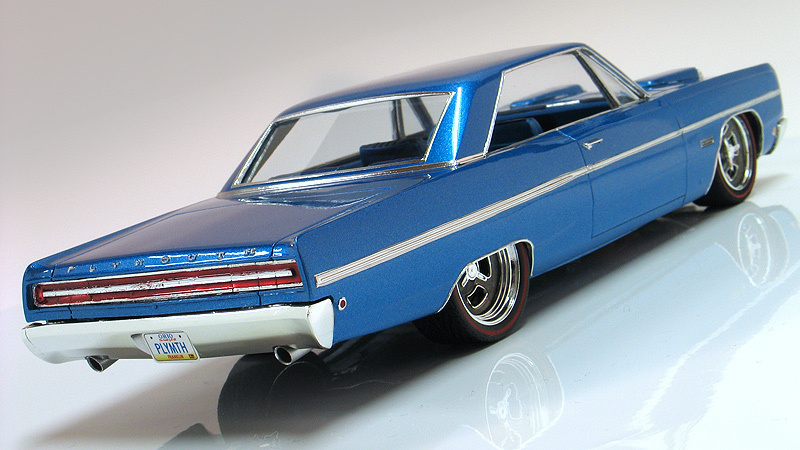 These ideas were the inspiration behind my build up of this resin 1/25th scale 1968 Plymouth Fury III 2-door. I started my build with a resin R&R Vacuum Craft re-pop of the old Johan kit. The resin kit comes with the body, interior, chassis, vac-formed windows, and plated bumpers. You have to supply the rest. I usually eliminate a lot of the trim work on my custom builds but I wanted this Fury to have a close to stock appearance so the body mods are pretty simple. 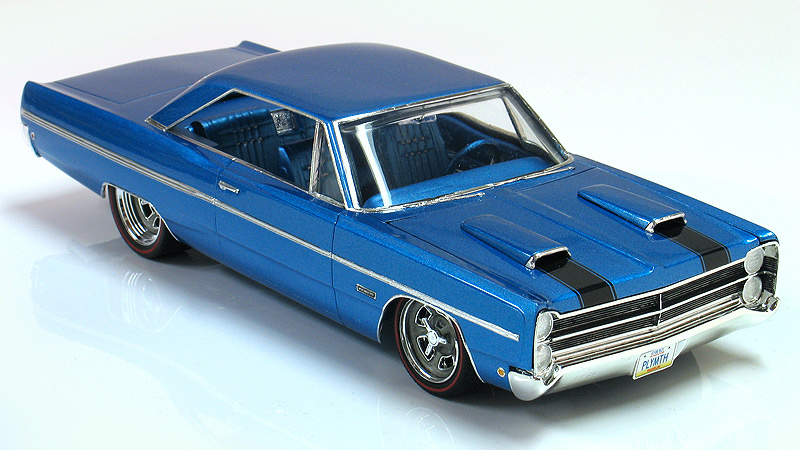 I wanted the Fury to mimick the look of the '67 GTX, so I added twin hood scoops from an AMT/Ertl '71 Duster kit to the hood for a more muscular appearance. I also notched the rear bumper for the dual exhaust outlets. 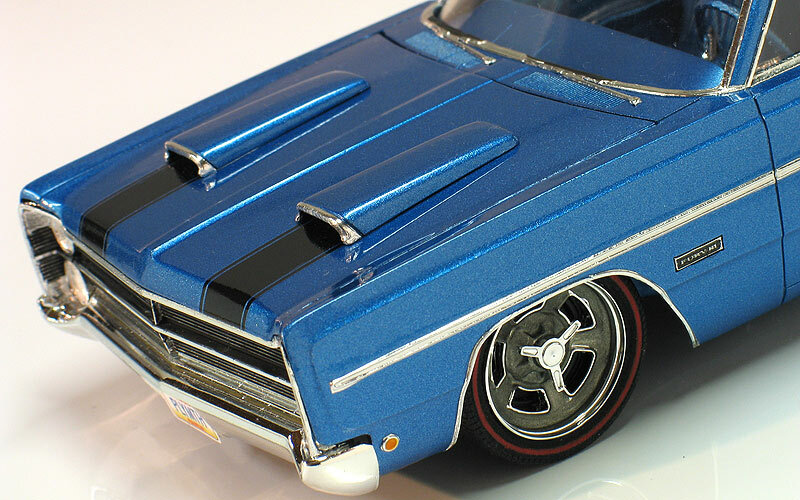 After cleaning up all the resin parts, I painted the body with a custom mixed automotive urethane lacquer close to the classic Mopar color called B-5 Blue. I mixed the color a little deeper and added a little more pearl to make the color really pop. The black hood stripes were cut down from a Bumble Bee rear deck stripe decal found in the AMT/Ertl '70 Super Bee kit. After applying the decals and BareMetal Foil the body was then clear coated with PPG Concept 2000 urethane clear. Another trick I did was to swap the resin '68 front grill with a rechromed Johan '67 front grill. The '67 had a cleaner design which I thought looked simpler. I also painted the tailights to look like they ran full width. These were some easy mods but I think they help the Fury look more aggressive. I call it a "678 Fury." I also wanted my Plymouth Fury to have with a killer stance. It's slammed and rolls on Pegasus Hobbies big and little Hellas. Just to be a little different I painted the center of the wheels in a flat metallic gray and then hand painted red lines on the tires for a classic look. Lastly, I added custom made license plates and aluminum exhaust tips.